Frederick M0RFD is building the spectrum analyser, with PCB's for each module. See preliminary photos here. A spectrum analyser is a very useful piece of test equipment to have on your workbench, yet the price tag of commercially avialable analysers places them way outside most hobbyist budgets, even when 2nd hand. 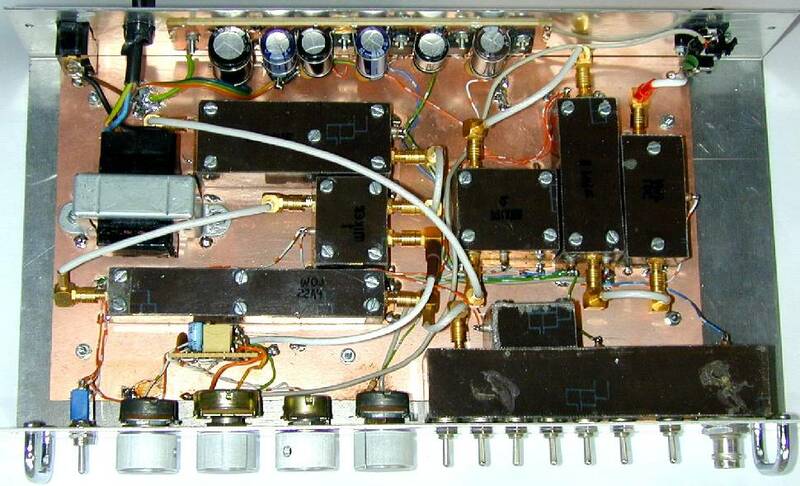 All is not lost - here's a spectrum analyser design you can build yourself that won't break the bank. The pages linked above describe the construction in detail. Most photograph insets can be clicked to view a larger high resolution image. This spectrum analyser uses an oscilloscope as the output display. Any old cheap oscilloscope is Ok, it doesn't require a dual channel 100MHz digital storage oscilloscope. My own 'scope is a cheap 5MHz Kenwood model CO-1305. Oscilloscopes with 5MHz bandwidth are now considered practically scrap metal and can be obtained very cheaply at surplus stores, rallies or on eBay. 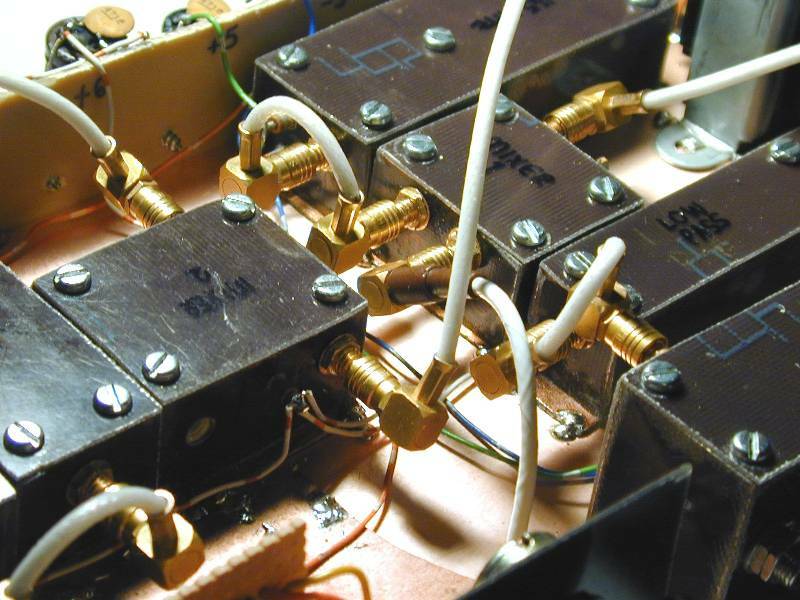 Above all, the "simple man's spectrum analyser" is easy to build. Of course some RF construction skill is useful but I personally am living proof that it can be built by a newcomer to the world of VHF construction. No complex equipment is required, no high bandwidth expensive oscilloscope, no frequency counter. No second spectrum analyser - it often amuses me when I see radio receiver construction articles saying "adjust the VFO frequency limits using another receiver" or similar advice. Since I have built everything in my shack myself often I just don't have available that other piece of equipment. I wouldn't want to build a spectrum analyser which required another to build and align: why would I want to build a spectrum analyser if I had one already! This analyser described here won't give you anywhere near the high performance of commercial analysers. Nor will its frequency coverage of 0 - 140Mhz approach that of the commercial analyser. Spurious responses will arise in the presence of very strong signals and the on-screen dynamic range is limited to about 70dB. Yet with its coverage of 0 - 140MHz this is a serious instrument that is a very useful design and construction aid. Construction and alignment of the "simple man's spectrum analyser" is as straight forward as possible. All that is required is a simple low bandwidth oscilloscope that will be used as the display for the spectrum analyser, and a basic signal generator for testing and alignment. The signal generator does not need to be accurately calibrated, I describe how to locate the necessary frequencies on its dial during the analyser construction. There are no PCB's to etch, no toroids to wind and NO difficult transformers to build or align. All the coils needed are air-wound using a few turns of copper wire and a screwdriver shaft or pencil as a former. I found it useful for tuning purposes to use an adjustable ferrite core for the 153MHz 2nd oscillator inductor. 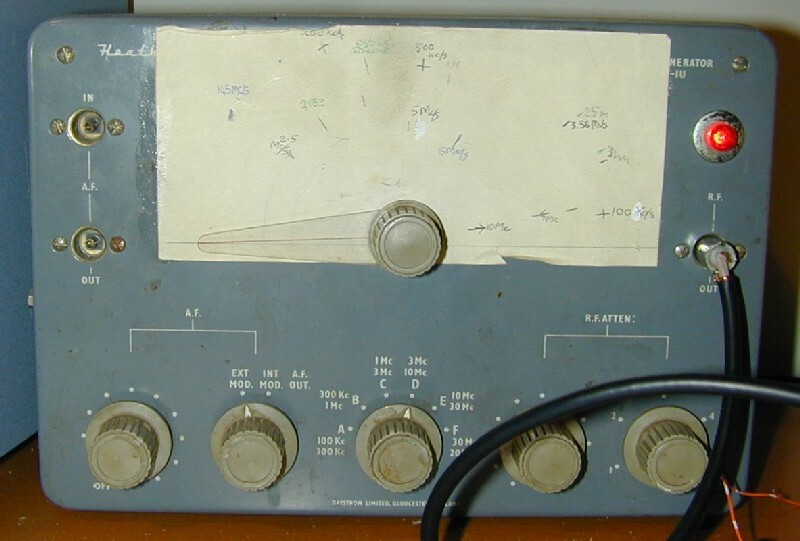 But it was selected from the junk box and I believe most constructors should have no trouble finding something similar either in their junk box or any old radio or piece of equipment. Good RF layout is important for the VHF sections. No PCB's were used, I prefer "ugly" construction, soldering components to an unetched ground plane. In some instances "semi" PCB sections were made for IC mounting by scratching tracks using a sharp knife. As might be expected good shielding is essential if rampant spurious signals are to be avoided. I built the 8 RF modules in simple shielded boxes made from single-sided PCB stock, but alternatively preformed metal enclosures could be used e.g. die-cast boxes. If the ten spectrum analyser modules are constructed in the suggested order (somewhat different to their logical order as in the block diagram), then each subsequent module can be built and tested using modules already constructed. This modular approach allows confidence to be gained as building progresses and should result in a fully functional spectrum analyser. Here are some more pictures of my spectrum analyser setup. Left: inside the box, showing the 8 RF module boxes interconnected by coaxial cables. These are fixed to a single-sided PCB sheet ground plane which is bolted in turn to the aluminium analyser enclosure from Maplin Electronics. The sweep generator needn't be screened and is built on perf board mounted behind the front panel tuning potentiometers. The power supply regulator board can be seen bolted to the back of the box which conveniently serves as a heat sink. Centre: my old Heathkit signal generator. 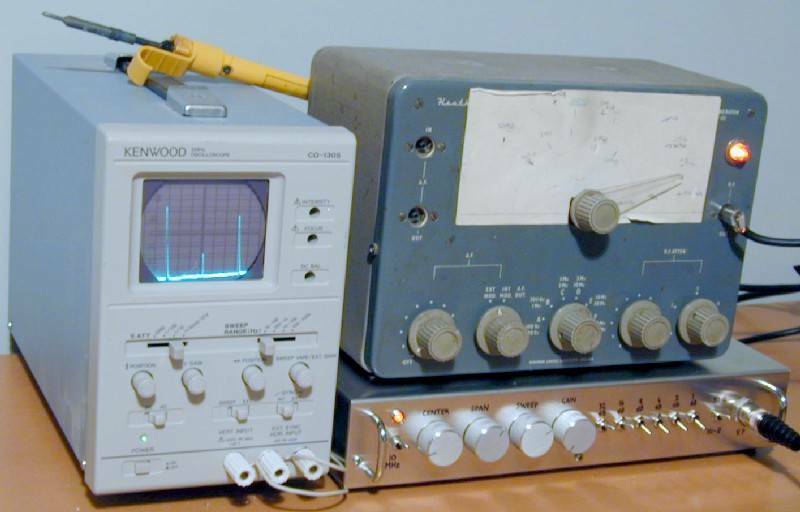 Right: Oscilloscope, Spectrum Analyser and Signal Generator. The generator is tuned to 30MHz; analyser range set to about 20 - 100 MHz. 2nd and 3rd harmonics shown nicely.